Importing stock level, price & custom product attribute updates from CSV and XML files into Magento has never been easier. Using the Magento Stock Import Module by XTENTO, importing stock and product information from third party systems into Magento is a breeze - and fully automated! Automate your inventory management and don't spend hours every day updating products and stock levels manually. Set up automated mass product updates today. 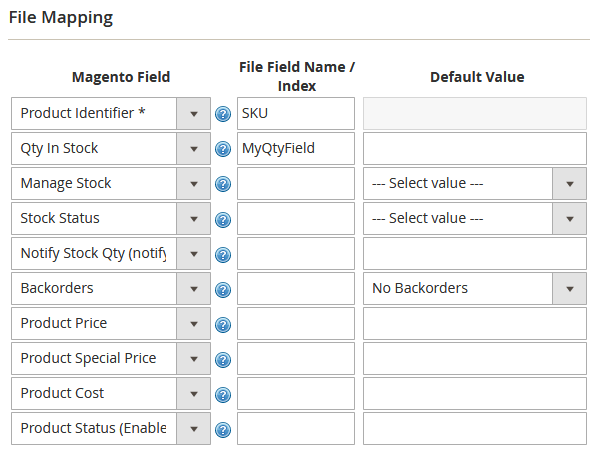 Seamlessly integrated into the Magento backend, setting up stock level imports has never been easier. Speeds of up to 1000 stock updates/sec (0.001s per product) and more are possible. Fully configurable from the Magento backend, this extension allows you to set up profiles to import stock level & product attribute updates of your products. Easily set up an integration with your warehouse, fulfillment center or supplier. Configure an unlimited amount of import profiles. Import as many different file formats with different settings as required. Set up different profiles for various tasks, for example, one profile handling a CSV stock file coming from one of your suppliers, and another profile for XML stock level synchronization with a warehouse. The "Product Identifier / SKU" field cannot be "updated", it is only used to identify the product to update. It is also possible to use a custom product attribute to identify products, for example if you have a product attribute called "warehouse_sku" it is possible to use this product attribute to identify products to update. Got some stock files on your computer that you need to upload into Magento? Or, need to give your new import profile a test run? Simply log into the Magento admin panel and go to the Manual Import section to upload your files. Detailed import results as well as if required debug information can be shown. Only modified stock items will be imported - speeding up the import dramatically. The extension does not use slow Magento dataflow nor product model functions to update stock items, but does the updates directly via the database - lightning fast. Have import files that are supposed to increase or decrease the stock level, such as "+5" or "-10"? Just enable "Relative stock level import" in the import profile and quantities imported will be added or subtracted from the current stock level. There are two options to control the "Stock Status" field of products: You can either have the extension automatically update it, based on the stock level / quantity imported. If the Quantity is greater than the "Qty for Item's Status to Become Out of Stock", the item will be set to "In Stock", otherwise to "Ouf of Stock". Or, you can import the "Stock Status" field from your import file and control it yourself. Alternatively a default value ("Always set to In Stock") can be set as well. If enabled in the import profile, when the stock level is imported, the extension will check how often the imported SKU is "blocked" in currently pending/processing orders, and the imported stock level will be reduced by that amount. While the extension comes with dozens of features, it's still easy to configure. It comes with an extensive documentation, as well as lots of information on how to set it up. Not sure how to set it up yourself? We offer services to handle installation/configuration for you. Map any file format. Various file formats (CSV/XML/...) are supported. Files can be deleted or archived after being processed. Once an import source has been attached to a profile, whenever the import profile runs, files will be fetched from the configured source. All profiles can be set up to run automatically, on a schedule. The built-in cronjob that schedules automatic imports of your profiles can be configured from the Magento backend. Simply have the creator of your import file place it on a, for example, FTP server, and the extension will connect & look for new files automatically, process them, update the stock level as well as delete or archive the imported file. 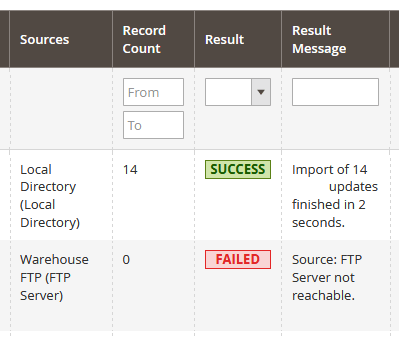 Use the Execution Log in the Magento backend to identify successful and failed imports. 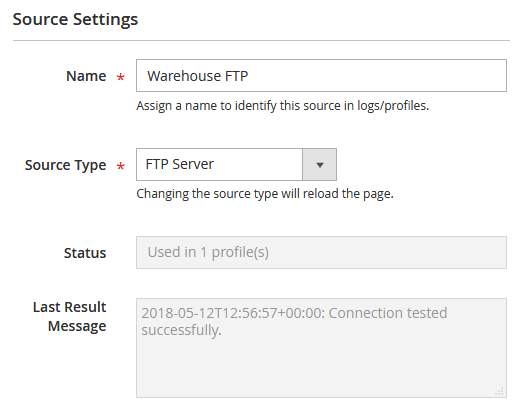 Check if there are problems with your import files, the import sources (such as FTP connectivity issues) or exceptions. Enter your email address in the extensions configuration if you want to get notified by email about critical errors or failed exports. Import the product price, special price and cost for products as well. 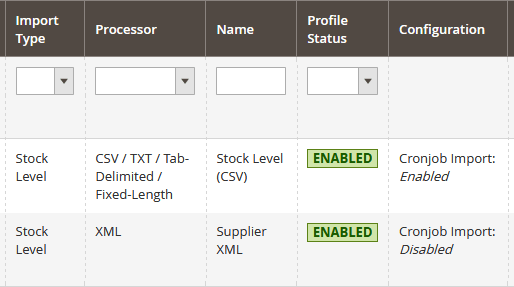 Bulk update custom product attributes such as the "back in stock date". Easily import stock level information as well as the product pricing from almost any file format. Please note importing these fields as well as custom product attributes will make the import much slower - for each updated product, this will take around 1 second, compared to 0.001 seconds for stock level updates. The Multi-Source Inventory feature coming with Magento 2.3 out of the box is fully supported by the extension. Update stock levels in each of your sources (warehouses) directly using the extension. Start imports from the command line. Schedule import jobs via the crontab directly without using the Magento cronjob. Import and export your profiles/sources using the Configuration Import/Export utility. Developers will love this. Using Magento 1? Contact us to request CLI script. Detailed import results will be returned showing which products have been updated and which haven't. The import can also be set up to run on a schedule, so full automatic periodical imports without any manual intervention are possible as well. The import processor for XML and CSV files is very flexible. Sample import files can be found at the below, but almost any file format can be imported. If you're using very advanced XML or CSV formats, please send us an email prior to your purchase to confirm compatibility with our import processors. Visit our demo installations configuration section to get a feeling for what formats are supported. This extension has been implemented in dozens of Magento installations already and has proven it is able to synchronize stock levels automatically for months and years. Any doubts? Check out the fantastic reviews. Multi-Warehouse Extensions: The extension also supports certain multi-warehouse extensions, which can be useful for your Magento store if you need to manage stock on a per-warehouse or per-store level. Please see our wiki for more information. Attention: This extension does not import new products into Magento. You can only use it to update existing products. The purpose of this extension is to update stock levels (and custom product attributes) for existing products in a very quick way. Fast and easy installation. Very complete module with powerful options. Very useful. This extension is really perfect. We had a little problem but the customer service has fixed our problem very fast. * Established compatibility with other email transports such as Ebizmarts/Mandrill for debug message mailing. * CSV Processor: If a product exists in multiple rows of the import file, the qty is summed up. * Fixed "Tools > Import" functionality: Sometimes source assigned to an imported profile were not automatically assigned to the imported profile again. * Fixed issues for manual imports where sometimes (especially in Internet Explorer, but also Chrome/Firefox) the profile drop down didn't work and no manual import was possible. * Fixed issue with profile configuration/profiles failing to load with error "... expects parameter 1 to be string, array"
* Fixed bug for profiles imported using "Tools > Import" functionality: Cronjob import never started until the profile was saved for the first time; now cronjobs are updated directly after the import via "Tools"
+ Added "xtento:stockimport:config:export" and "xtento:stockimport:config:import" commands that add "Stock Import > Tools" functionality for the Magento command line via php bin/magento. + Added support for negate="true" attribute for "Additional Configuration" <use>, <map> and <skip> options. Match if preg_match does NOT match. * Fixed "Additional Configuration" options for XML import profiles. Sometimes an error about an undefined config was shown. * Fixed "xtento_stockimport_mapping_get_fields" event, fields can be customized via the event now. * Deleting a profile also deletes the profiles cronjobs now, to avoid "zombie" cronjobs that don't do anything. * Fixed error when trying to view a broken import profile: "Invalid argument supplied for foreach() in ... AbstractMapping.php"
+ Added ability to run arithmetic operations such as + - / * on imported values. Increase imported price by 20%, for example. + Added support for Magento 2.3 MSI (Multi-Source Inventory) feature. Import stock levels per source! * Final fix for built-in editor (Ace.js) having issues with tabs/spaces/theme. Be sure to deploy static content after updating.